How about you? (If you run Ubuntu, read this – which is why I tried scaling my 1280 desktop to a 1024, in the first place). This is kind of a proof of concept I’ve been playing with. The idea is that finding a file within a folder is often easier by type, and you are often only interested in the most recently modified file. The problem with a file manager is that although you can easily sort by either type or modification time, you cannot filter your view of all the other files you’re not interested in. I previously wanted to address this issue within Nautilus, (and I still believe this functionality would be wonderful in Nautilus), but I ended up doing this much less ambitious applet as a proof of concept. Steven is catching up on the latest on planet.gnome.org and has downloaded a couple screencasts demoing the latest and greatest. These files are typically 2-10 megabytes, so they didn’t download instantly. Steven continues reading and forgot about the screencasts until a couple hours later. At that time, he can simply click on the File List Applet, select Downloads, select Video, and look at the top of the list for the newest files. Steven is happy. When finished, he can follow the same process to delete them – without once opening his file manager and being assaulted with ALL the files in his Downloads folder. I had a problem recording audio, so I ended up typing as narration. Unfortunately, this makes the YouTube one pretty unwatchable, but you can give the “HQ” version a try. No tarball yet as it’s still extremely rough. Installing will require some manual modifications. Adjust the FileListApplet.server file’s location to wherever you keep it. Then copy FileListApplet.server to /usr/lib/bonobo/servers/. Add it to the panel like other applets. Update 2008/12/05: Added a couple screenshots. The desktop – this gigantic area of screen real-estate – is a mess. Some people use their desktop to dump random files that they’re working on, or have recently downloaded. Others work tirelessly to keep the pretty background picture visible with minimal icon clutter. Still others find the Desktop useless because it fills up with icons too easily. 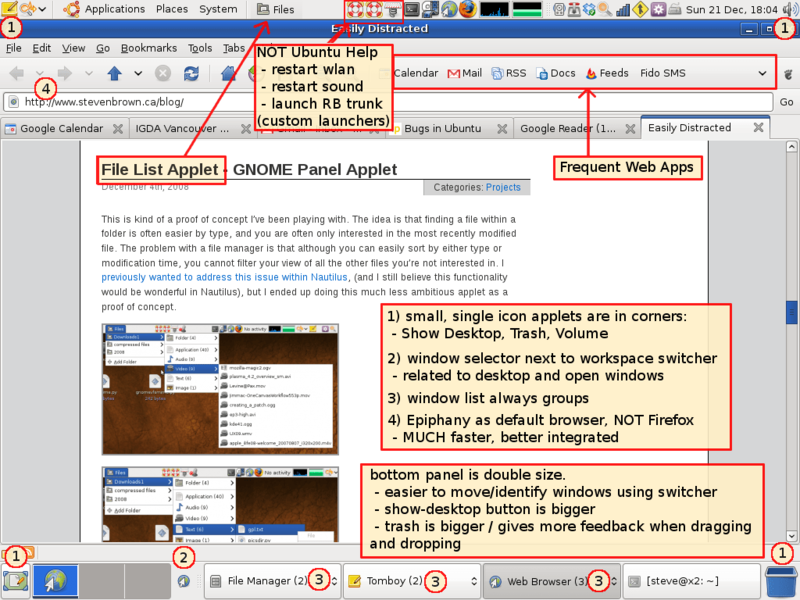 In the Nautilus Desktop (GNOME’s default), icons can get placed on top of one another either by a bug in placement or simply because there is no space left, which really deters from the usability. Personally, I clump different themed files/folders into the corners of my desktop. When a file is added to the desktop procedurally, there is no obvious place to put it and thus no obvious place to look for it. This is compounded if there is a “hole” in one of my “icon clumps,” in which case the hole may be filled with the new icon making it extremely difficult to locate by both file name and screen location. I recently gave up on having mounted drives displayed on the desktop. Anything dynamic fails miserably as their location changes each time, and sometimes they even end up overlapping other icons. In any case, it seems the desktop requires maintenance to work, when it really shouldn’t. An Intelligent Desktop would overcome icon clutter automatically and intelligently. It would also be a starting point to looking at potential benefits of a more dynamic desktop view. I’ll explain what I mean by this in a second. This is NOT that silly little notification that your desktop has old/unused icons on it. The desktop is a useful place to dump files, but retrieving them is a pain. In fact, browsing the desktop for that particular file (or folder) is a pain without a lot of maintenance. My idea requires an always-visible, on-the-desktop set of UI elements that I will call the Desktop Action Window (DAW). The easiest way to think of the DAW is as a sidebar for the desktop. (Don’t stand up quite yet, sidebar haters.) But rather than the DAW being a collection of meta-information or unrelated widgets, think of it as a controller to the desktop view (formerly just a desktop). Performing actions on the desktop via the DAW simply creates a new view of the desktop. 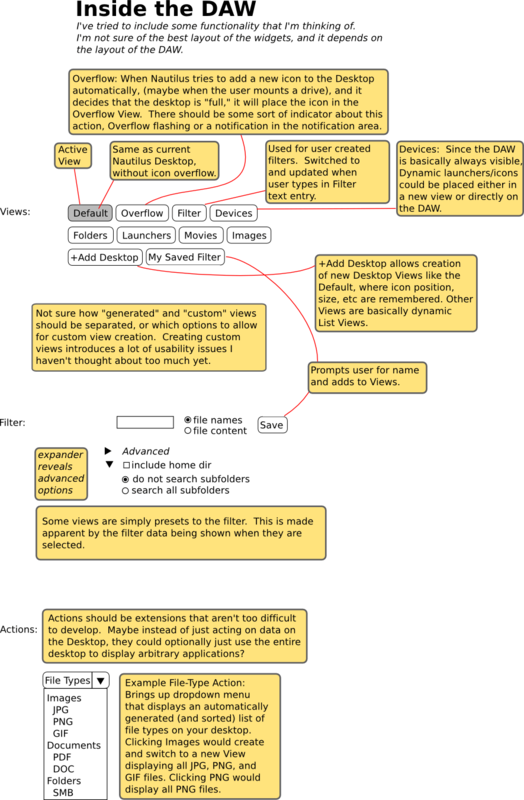 The original/default view that is customized by the user will always be available. If you think in terms of Model-View-Controller, the current desktop is essentially everything. 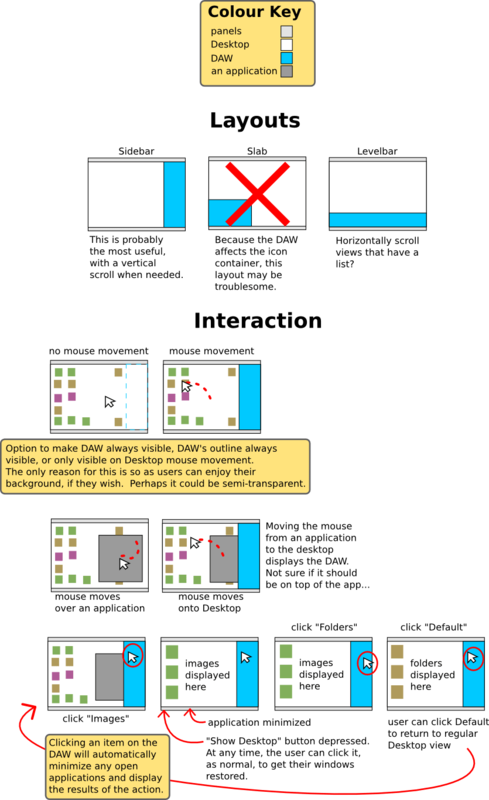 With the DAW, the DAW becomes the controller, the desktop viewing area becomes the view, and the model is partially hidden. The DAW should allow easy management of multiple views of the desktop, some automatic (Images, Movies, Recently Modified), some static (Default, Custom). And you shouldn’t be concerned about a sizable widget infringing on your carefully chosen background, there are ways around that: the DAW could be hidden when no mouse movement on the desktop occurs (like the controls of a photo slide show), it could be semi transparent until the mouse is over it, it’s location could be customized, etc. An automatically generated list of types of files on the Desktop. Selecting one of them displays all icons of that type. A text entry for string pattern matching. Ability to have custom views displaying only icons that user specifies. Some form of icon pager or scrollable desktop view to allow for arbitrary numbers of icons to be displayed per view. Ability to view and manipulate an arbitrary folder, such as Home, in the same way. This is where I stop the prose and leave you with a couple mockups. The “Overflow” view could probably be replaced with “New” or “Recent” for recently modified files. Anytime new files/folders/launchers have been added, the button could be flashing to grab the user’s attention. Better not to alter the default view at all, I think. 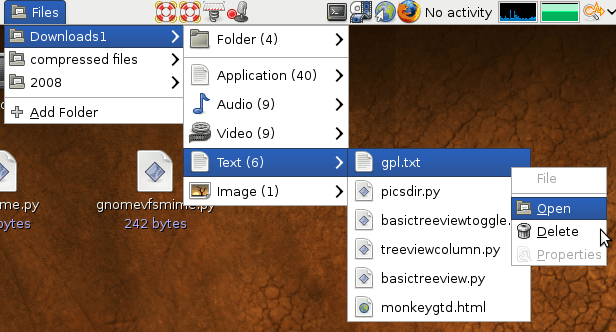 Update 2008/12/04: I’ve started implementing what I was thinking about with the automatic view filter as a GNOME panel applet. Check out File List Applet.